Esther Alice Chadwick begins her book with the Greek etymology of hygiene - hygeia. 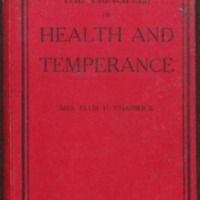 She argues that ‘by studying hygiene we learn how to prevent sickness and disease, to keep the body and mind strong and alert, and to preserve their powers as long as possible’. She focuses on the both role of society, and of the individual. The first half contains extensive chapters on how to create personal health through selecting meat, vegetables, diets, exercise, etc. The second part of the book explores how this transforms into temperance, which supports society. iv, 180 pages :illustrations ; 19 cm.